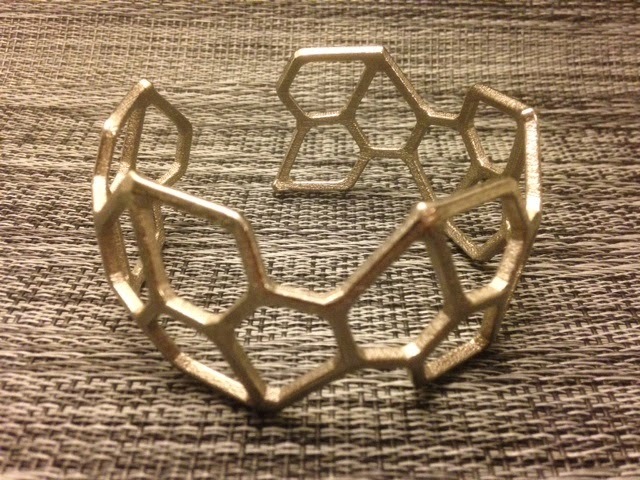 Back on Day 218 we printed a bracelet built by extracting the center rings of a Pentagonal Hexacontahedron in TopMod. This week we finally received the stainless steel version we ordered from Shapeways, and it is beautiful! It's pretty bulky so it isn't cheap, and you have to physically bend it open to get it on, then closed to make it tight again (although repeated bending does not seem to have any ill-effects so far). If you want to purchase one you can do so at the Shapeways link below. Or you can download my file from Thingiverse and print one for free on your own machine! Settings: For printing yourself, see Day 218. For Shapeways, just choose the metal that you want and they will do the rest.